3 toddler friendly Autumn crafts. Can you believe the summer is over already!? There is definitely more of a chill in the air and the nights are getting darker earlier and earlier by the day. 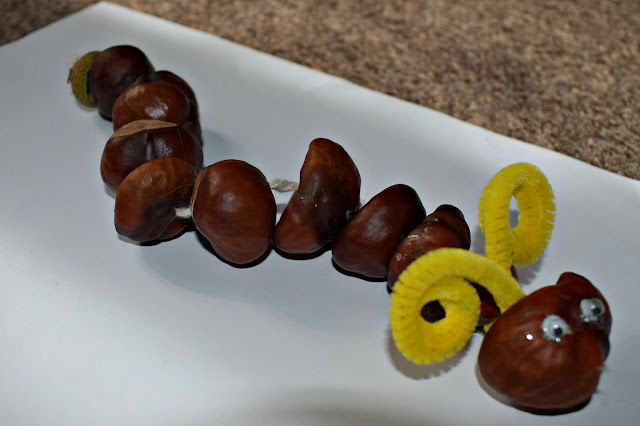 We drove past some conker tree's on our way to school this week and my son was so excited about going to collect conkers again this, which for me thinking about what Autumn crafts we could do. So here are some of our favourite Autumn crafts, if you do have a go at any of them I would love to see your results over on my Facebook page or Twitter page! Gather up lots of different sized conkers and get a grown up to drill a small hole through the centre of each one (we used a thick needle and thread for some but it was quite tough so a drill would be quicker). Thread each one on to wool or string making sure you use your biggest conker first as this will be the head, we then placed an acorn casing at the tail end of ours. Tie of the ends of your string and you could now draw a face on your catapiller or even paint it! We used some googly eyes and a pipe cleaner for ours. Collect lots of autumn leaves that have fallen to the ground. Try to make sure you have lots of varieties, shapes, colours and sizes. 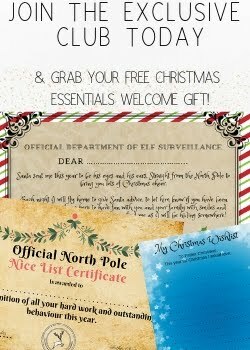 Arrange them on paper to look like your favourite animals or creatures! You could even make up your own creatures or aliens. We used googly eyes for ours but you could also use felt tips to make the faces and features. 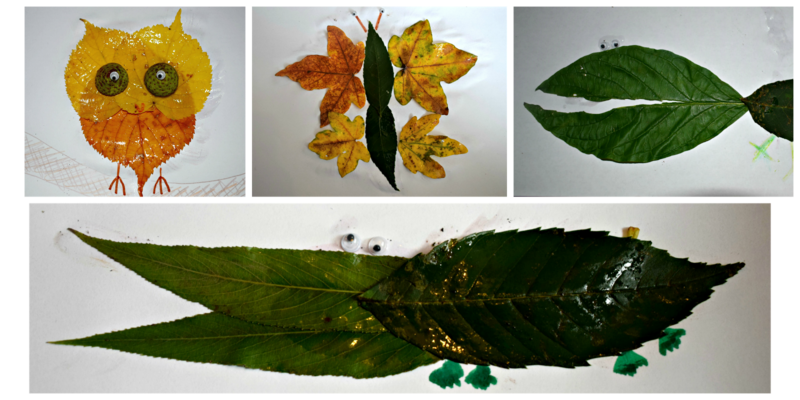 Either use some of the leaves you gathered for the leaf animals or collect some more for this craft. Gather up lots of leaves (we have found that if they are too crunchy or dry they don't work as well though). 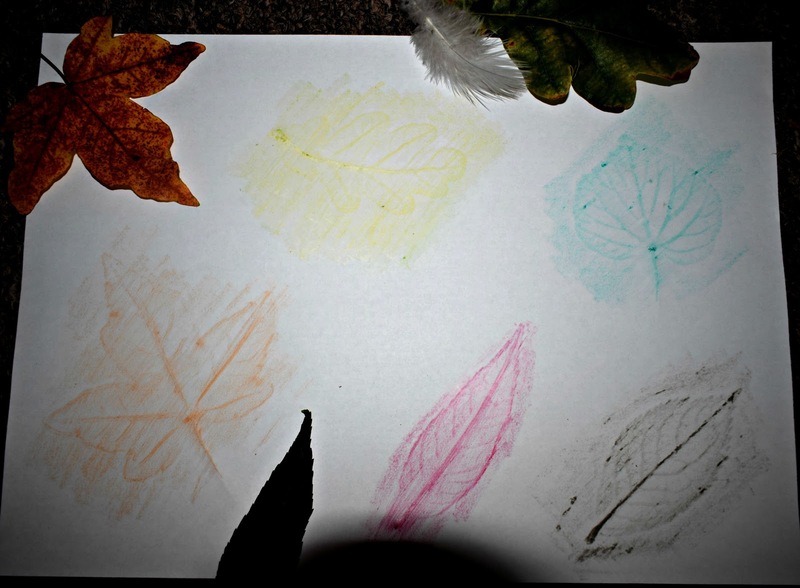 Place each leaf under a piece of paper and use wax crayons or pencil colours to carefully rub/colour on top of the paper with your leaf underneath. It creates a great effect especially if you use lots of autumn colours and variety of leaves. Are you looking forward to the Autumn/Winter and being able to snuggle up on a winter evening in your pjs or are you more of a summer person?